An unavoidable part of a professor’s job is evaluating other people’s academic work. Along with the midterms, bibliographies, proposals, response papers, seminars, essays, and final exams that we grade for our students, we are also called upon to evaluate the work of our peers. This can be an odd process. For example, I have never won a major research grant (because I don’t generally apply for them), but I have evaluated other scholars’ research grant applications. I have never written a book, but I have assessed more than one book manuscript for an academic publisher. I have published some articles in scholarly journals, but I have assessed dozens and dozens written by others. This is called “service to the profession,” and I am happy to do it–most of the time. However, it sometimes feels that if I spent less of my time and energy on assessing other people’s scholarship I’d have more time to produce my own. I think Canadianists do a lot of this work compared to some other fields. If you are an American literature professor, for instance, there are all those American literature professors in the US that journals and presses can call upon. But we’re a small cohort here in Canadian literature. So small that at times, even though the peer reviewing process is blind, I am pretty sure I know who wrote the paper I’m evaluating for publication. 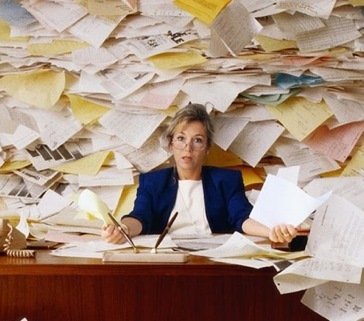 It’s that time of year, when we are all buried under stacks of papers to grade–a cliche nicely captured in this image which I borrowed from the UWaterloo Centre for Teaching Excellence website. It’s also the time of year when our own annual performance reviews are submitted. If graduate students think that when they grow up and become professors themselves their work will no longer be ‘graded’ they couldn’t be more wrong. Every time we submit an article, a proposal, an application, a manuscript our work is judged. And not always very politely. Every course is evaluated by students who took it. And not always very politely. Every year we write up what we have done that year in the three categories (research, teaching, and service) and then our work is ranked with a numerical score that also translates into a pay increase. We are competitive by nature, so we feel inadequate if the score is low and the scores of our colleagues are much higher. We are afraid of appearing to be weak, unproductive, lazy, stupid….all of those anxieties I’ve written about before. Criticism still stings, even after all these decades of living, working, and loving academia. Ah, well. Fill up the coffee cup and get on with it!